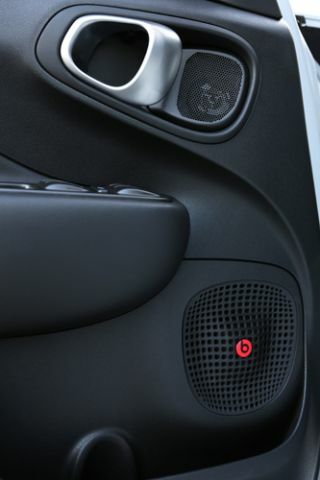 Beats and Fiat collaborate on new 500L in-car audio system | What Hi-Fi? Fiat has announced details of a new collaboration with Beats by Dr Dre that will see a 520W, Beats-branded audio system feature as standard across the Italian car manufacturer's new 500L range. The new 500L Beats Edition range features two petrol engine and two diesel engine models – all of which will incorporate a premium BeatsAudio system to offer a rich, immersive in-car experience. An eight-channel DSP-equipped amplifier generates the 520W total output, with the seven-speaker system including two 80W mid-range speakers located in the lower part of the front door panel. You'll also find two 40W tweeters in the upper part of the front door panel; two 60W full-range speakers in the rear door panel; and an 80 + 80 W subwoofer located in the boot of the 500L. Meanwhile, the BeatsAudio system's amplifier will make use of advanced equalisation algorithms to recreate the sound spectrum that is experienced by artists during studio recordings. The inclusion of the BeatsAudio system is just one component of the new 500L Beats Edition range, which also boasts new engine variants and new optional equipment, as well as an urban design. In-car technology is one of the trends expected to go large in 2014, and we've already seen some of the examples of what's coming our way this year at CES 2014 in Las Vegas last month. We heard that Google had joined forces with General Motors, Honda, Audi, Hyundai and Nvidia to form the Open Automotive Alliance (OAA), which will build an Android platform for in-car use. Meanwhile, Monster was on the CES showfloor to announce it will be producing a high-performance in-car audio sound system for the £3m Lamborghini Veneo Roadster. Just nine will be made though. Add to that the Naim for Bentley in-car audio; the Panasonic and Abbey Road Studios in-car concept seen at CES; and BMW's in-car streaming service and you'll see this trend moving into second gear.